Banking Awareness Quiz 8 – Practice Sets article provides the list of several bank related questions to prepare aspirants of different competitive exams in India, primarily for banking related employment. The article Banking Awareness Quiz 8 – Practice Sets is very useful for different exams such as IBPS PO, Clerk, SSC CGL, SBI PO, NIACL Assistant, NICL AO, IBPS RRB, Railways, Civil Services etc. 3. Which of the following is not commercial bank ? 5. Which of the following statements are true about Working Capital ? (A) Working Capital is a financial metric which represents operating liquidity available to a business, organization, or other entity, including government entity. (C) The management of Working Capital involves managing inventories, accounts receivable and payable, and cash. 7. Which of the following Negotiable Instruments can be crossed to the banks ? 9. When does the central Bank increase the minimum statutory cash reserve ratio of the commercial banks ? 10. Which one of the following represents capital adequacy ratio for commercial banks ? A. Asset which is not usable as a medium of exchange but has as store of value. B. Asset that serves as a temporary medium of exchange and has a store of value. C. Asset which adequately fulfill Store of value function and is readily convertible into a medium of exchange but is not itself a medium of exchange. 3. Which of the following term is used in banking ? 4. Which amongst the following banks used Tiny Cards with bio metric identification as a part of the financial inclusion ? 6. Which of the following assets are considered as near money ? 8. Which of the following would reduce the credit creation capacity of a commercial bank ? 9. Which of the following does not form a part of the foreign exchange reserves of India ? A. Exporting as much as possible and receiving gold. B. Reallocation of existing goods between the two countries. 1. The Reserve Bank of India has been intervening in foreign exchange market of India and buying dollars to ___. (B) Build – up foreign exchange reserves for debt servicing and debt repayment. (C) Prevent the rupee strengthening further there by acting as disincentive to export growth. 2. Non-Performing assets of commercial banks means their loans _____. A. Fetching very low rate of Interests. B. For which interest/installment has remained unpaid after due date. C. Given to sick industrial units . D. Have not been disbursed at all . 3. Which of the following is not the feature of Real Time Gross Settlement (RTGS) ? B. Settlement of funds is revocable. C. Settlement is done in real time. D. It is a fully secured system which uses digital signatures and public key encryption for safe and secure message transmission. 4. The definition of ‘Banking’ is given in _____. A. Negotiable Instrument Act. 1881. 5. In the case of FCNR Accounts the payment of Interest is effected in _____. C. Same currency in which deposit stands. 6. The commercial paper is issued to raise deposits by _____. 7. The Methods of credit control used by the RBI can be divided into _______. 8. Increase in Bank rate is generally followed by ____. C. A rise only in the deposit rates but not the lending rates. 9. Which one of the following banks creates credit ? 10. Which of the following is the least liquid asset ? 1. Which of the following is /are the most important component of the liabilities of Commercial Banks in India ? 2. An increase in foreign exchange assets of Reserve Bank of India will mean_____. 3. Which one of the following is not a method of credit control ? 4. The largest Nationalized Commercial Bank in India at present is ____. 5. Reserve money includes _____. 6. Which one of the following is not an objective of fiscal policy ? 7. Which of the following is not included in infrastructure in India ? 8. The National Agricultural Insurance Scheme was started by the Government of India in _____. 9. Interest on national debt is included in ______. 10. Which one of the following is not a measure of Globalization ? 1. Which sector contributes most to the savings in India ? 2. The State Bank of India was established on the recommendation of _____. 3. Money Supply as defined by the Reserve Bank of India, M1 includes ___. 4. The most important source of financing the State Government’s Gross Fiscal Deficit (GFD) in India has been______. 5. The system of Ad-hoc Treasury Bills in India was replaced by Ways and Means Advances with effect from ____. 6. In the context of liberalization and globalization _____. A. Is levied and appropriated by the states. B. Is levied by the union and collected and appropriated by the states. C. Is levied by the union and shared by the union and the states. D. Is levied by the union and belongs to it exclusively. 8. Which of the following is an example of near money ? 9. _______ is a financial institution which mobilizes savings from the people and invests then in a mix of corporate and government securities. 10. Which of the following is not a objective of Bank portfolio management ? 1. A Bank which controls credit is called _____. 2. When the government imposes physical and monetary controls to check open inflation, It is known as ____. 3. The causes of deflation is/are _______. A. Lack of goods and services as compared to money supply. (C)Lack of money supply as compared to supply of goods and services. 4. Which one of the following is not a function of Central Bank in a country ? 5. The system of Note Issue followed by Reserve Bank of India is ____. 6. A group of countries which has abolished all Traffis and also quantitative restrictions between themselves is called ________. 7. Which one of the following is not a priority sector lending by Commercial Banks in India at present ? 8. Many times we read that a corporate entity is in the process of raising its capital base. Why is a company required to raise money to strengthen its capital base? 9. What are Teaser Loan rates charged by Banks ? A. Rate of interest in the initial period is more and it goes down subsequently. B. Rate of interest in the initial period is less and goes up subsequently. D. Floating rate of interest charged by Banks. 10. Which of the following institution is considered as ‘ soft loan window’ ? 2. In which year SMERA (Small & Medium Enterprises Rating Agency) was established ? (C) It provides short- term funds for Banks. 9. Which of the following was the first commercial Bank of limited liability managed by Indians ? 10. ————— is an agreement where by an issuing Bank at the request of the importer (Buyer) undertakes to make payment to the exporter (Beneficiary) against stipulated documents. 1. What are Time Liabilities ? B. The liabilities which Bank have to pay after specific time period. 3. As we all know that Reserve Bank of India manages the circulation of currency. In this context which of the following decides the currency denomination value ? 5. Which of the following is India’s one of the major Micro finance Institution ? 6. When does the Central Bank increases the minimum statutory cash reserve ratio of the Commercial Banks ? (C) When the Central Bank aims credit contraction. 7. The primary objective of selective credit control is _______. A. To raise the cost of credit for all purposes. B. To decrease the total supply of credit in the economy. C. To regulate total Bank credit and general level of interest rates. D. To influence allocation of credit among different borrowers and users. 8. Consider the following measures. Which of the measures given above are taken by the Reserve Bank of India to control inflation in India ? 9. Bank rate refers to the _____. A. Interest rate at which Commercial Banks accept deposits from the public. B. Rate at which Central Bank re discounts bills of exchange of Commercial Banks. 10. Which of the following would reduce the credit creation capacity of a Commercial Bank ? 1. Which one of the following items is not included in the current account of India’s balance of payments ? 2. The Reserve Bank of India placed the greatest reliance on which of the following measures of credit control for maintaining price stability during the last ten years ? 3. Which one of the following groups of items is included in India’s foreign exchange reserves ? A. Foreign-currency assets, Special Drawing Rights (SDRs) and Loans from foreign countries. D. Foreign-currency assets, Gold holdings of RBI and Loans from the World Bank. 4. If there is an inflationary trend in the economy what would be the trend in the pricing of the Bank products ? 5. For a closed economy having no foreign trade which one of the following is correct ? 6. The ability of a commercial Bank to increase its loans and Investment depends on its _______. 7.’Economic Development’ is a _______. 8. Which of the following is not a feature of Micro finance ? A. It provides gainful financial services to unemployed and low-income individuals. B. It promotes saving of money by individuals. C. Interest rates are generally lower than those offered by normal banks. D. Micro finance operations make profit from the poor. 9. Which of the following is not the part of the scheduled banking structure in India ? 10. Which of the following cannot be called as a value Added service offered by a Bank ? 1. Opening the Saving Bank Account of a minor girl will be called as which of the following in Banking terminology ? 2. 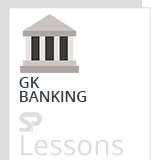 Which of the following terms is NOT used in Banking Sector ? 3. Banking Sector will fall under which of the following sectors? 4. Which of the following is NOT a measure of the Risk Management in Banks ? 5. Which of the following Acts was framed to deal more effectively specially with the problem of Non- Performing Assets in banking system? 6. Many times we read a term CBS used in banking operation. What is the full form of the letter ‘C’ in the term ‘CBS’? 7. Name any E-Banking service which is based on voice processing facility ? 8. Non Performing Assets are those assets which are overdue for a period of more than ? A. 90 days in interest and/or installment in term of loan. B. 90 days out of order in case of over draft/cash credit. Bills purchased and Bills discounted. C. 2 harvest seasons for advances for cultivation of short duration crops. 9. _______has been set up for exchange of credit information among its members ? 10. Basel – II norms are associated with sector.